To search for one or more of your existing documents in 'Documents View,' locate the 'Find a Document...' text box to the top right of your 'Existing Documents' panel. Type in your search keyword to find your desired document by Name, Number, or Description words. Then, click 'Enter' on your keyboard or click the button to the right of your entered text to display your search results. 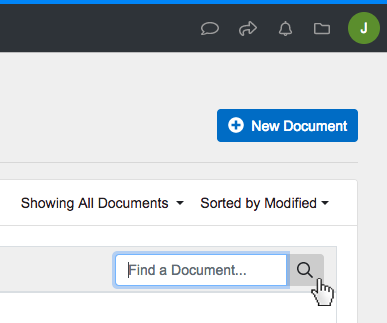 To search for one or more of your existing documents in ‘Documents View,’ locate the ‘Find a Document…’ text box to the top right of your ‘Existing Documents’ panel. Type in your search keyword to find your desired document by Name, Number, or Description words. Then, click ‘Enter’ on your keyboard or click the button to the right of your entered text to display your search results.